It seems like sometimes the only people who really know about a thing, are the people who have experienced it. Cerebral palsy is kind of like that. It's common enough to have a fantastic, large support network in DC, Maryland and Virginia but there's not a whole lot known about it typically to those who are on the outside. 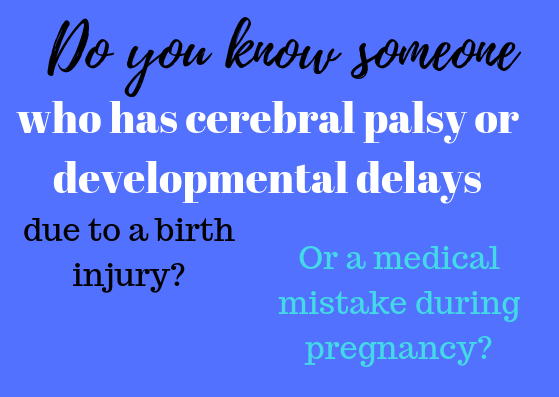 Because cerebral palsy is sometimes not diagnosed until the child is old enough to notice a delay in motor skills and other types of development, medical malpractice can go unnoticed. The parents are overwhelmed with the news, the adjustments they have to make, the special-needs resources they have to research and other practicalities that come with the diagnosis. Who has time to go back to the hospital, analyze medical records, test results and studies, and determine the cause of their child's cerebral palsy (because the hospital will never tell you they caused it)? 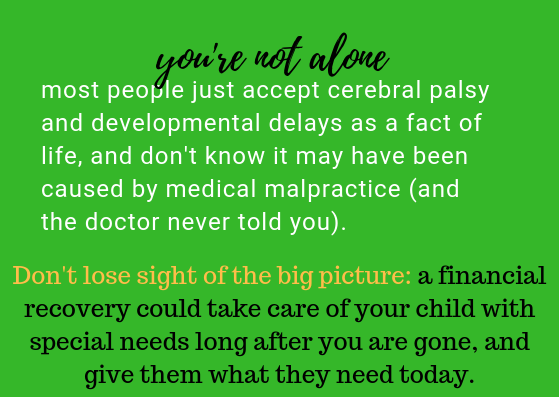 I recently saw a question posted on a cerebral palsy support page on Facebook, asking a poll as to how many parents have long-term plans for their kids. I was amazed (but not surprised) at the number of parents who did not have a long-term plan for their kiddos. A day in the life of a child with CP is lived in daily increments. But a long-term plan is crucial because, let's face it, the parents aren't going to be able to care for the child forever. And most CP kiddos outlive their parents. At Donahoe Kearney we try to make it easier on the parents. We bring all of the information to them in what we call a Special Needs Packet - which includes articles on the cause of cerebral palsy (which is lack of oxygen to the brain, or the medical term is asphyxia), often the result of residents and interns at a DC hospital who do not recognize the signs of fetal distress and need to deliver the baby before it's too late, a checklist on how to spot developmental delays, a how-to guide on how to investigate your child's medical history and your (the mother's) medical history (because asphyxia is almost always caused by an undiagnosed problem or delay in delivery). And finally we top it all off with the Special Needs Resource Guide - our signature book detailing resources available to children with special needs and their families. If we have helped out a family, that's good enough for us. But if that family has been affected by medical malpractice and we can help them get a settlement to cover the lifetime costs associated with cerebral palsy, to give them some freedom and take away some of the stress and worry they are feeling over what will happen to their child when they can no longer take care of him or her - even better. Click on the video below to learn more about our philosophy from our Client Services Director, Brooke Birkey. CALL US TODAY AT 202-393-3320 for a free informational interview and free resources for you and your child.